The BaduStream II Jet System is a water treadmill and offers many different options in a wide price range all aimed at pleasing a variety of exercise styles and budgets. The system accommodates installation in limited space and varying pool wall designs. 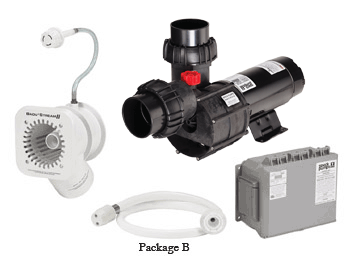 Speck 4 HP or 3-1/2 HP self-priming, plastic pump. UL Listed, single phase with thermal overload (no motor starter required).